With Spring finally taking centre stage, every aspect of me is grateful for the warmer weather, except my skin. My skin can't cope with the roller coaster temperatures. One day it's searing and we're needing to slap on sunscreen, the next it's blanket on the sofa weather and I have to pop the heating on. I've always suffered with psoriasis, ever since I can remember and though there has been periods of time when it disappears, it always comes back. Since having my boys it's been worse than ever, popping up in areas that I'd never had it before, my back and scalp being the worse affected. After trying almost everything to help it, I'd decided to switch to Balneum for the past month and I couldn't be more pleased with the results. I'd never heard of Balneum before last month, and to be honest I was pretty sceptical when I heard they were claiming to relieve the itch of dry skin within five minutes. I've used a lot of lotions and potions, prescribed, over the counter, off the shelf, you name it and I can gaurentee I've owned it, yet none of them have worked for instant relief. 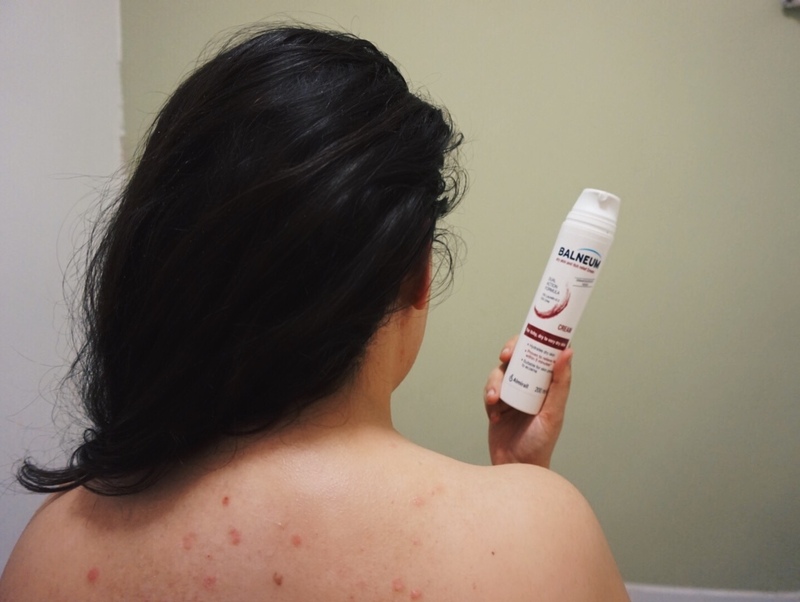 There are a lot of grand claims in the skincare industry and not many deliver, thankfully Balneum's Itch Relief Cream doesn't fall under this category. It was the first thing I wanted to put to the test and after an incredibly hot week in April, my skin was calling out SOS more than ever. I popped the cream on and eagerly set a timer on my phone, during the waiting window I started to cleanse my face then I brushed my teeth and wandered off into the bedroom - completely forgetting the ongoing trial, simply because it had worked. My back and neck are the worst itching areas for me, littered in small red patches of dry skin and I have been guilty of itching them till they bleed when they're at their worse, this was going to be pivotal in my daily routine now. Balneum don't just stop with the cream, they also have a couple more products in their range and the Anti-Itch Shampoo really intrigued me, as I said the other problem area for me is my scalp. It's my far my biggest annoyance, I can almost deal with the soreness on my back because I can't always get to it nor can I see it, but I can't hide my scalp away. I knew the shampoo wasn't going to be quite as fast acting as the cream, but I was pleasantly surprised that on first use it didn't sting my scalp, even though at the time my head was completely raw and bleeding from the dry skin itch. I'd previously used polytar when my scalp was in a bad way and it would always hurt when I massaged it in, the scent was really offensive too and would linger for hours after washing, thankfully Balneum didn't have any similarities there, it just felt like an ordinary shampoo except with magical healing powers. Another big difference that I noticed with the Balneum shampoo it didn't feel like your typical itchy scalp shampoo, it still cleaned my hair just as well as my higher end brands and left it just as shiny. Though it focuses on relieving the itchy scalp, it is a product that ticks many boxes for me so I don't feel like I'm losing out on other aspects I look for in shampoo, by getting the soothing qualities. It's been a whole four weeks since I began using the products. For me the ultimate 'couldn't live without' find is the anti-itch cream, it's a complete miracle worker. I have even used it in my scalp for an immediate result when I haven't got time to wash my hair there and then, it works a treat and I've already recommended it to friends. Over the weeks I have noticed that my dry patches on my back in particular are getting smaller, they're less angry and it's pretty obvious if I have missed some patches in the week as by the weekend you can really tell the difference. The skin that has had the cream applied is much more hydrated and happy compared to the patches that got missed out thanks to my poor reach. If I had to have one negative, I would say that I wish it came in a travel sized option too, we're heading away at the end of next month and with it being Turkey, I know there will be a tonne of air conditioning which will dry my skin out no end. Balneum is going to be a travel essential without a doubt but I'll have to bring the full size, which is a little bulky, I've had to decant it into small pots to keep in my handbag for day trips since discovering it. *This is a sponsored post in collaboration with Mumsnet and Balneum, as always all opinions are completely my own. I've never heard of this brand before but sounds like it's been a lifesaver. There's nothing worse than being itchy!! This looks absolutely fantastic. I'm a psoriasis sufferer so I'm going to check this out now! That's great that you've found something that works so well. I can't imagine what it must be like to itchy all the time! Oh this sounds great. I really struggle with dry skin and I am always looking for something to help with my scalp too. I will be checking these out. I have never heard of this brand before. But it sounds pretty great. 'WHAT HAVE YOU DONE AT SCHOOL TODAY?' NOTHING.